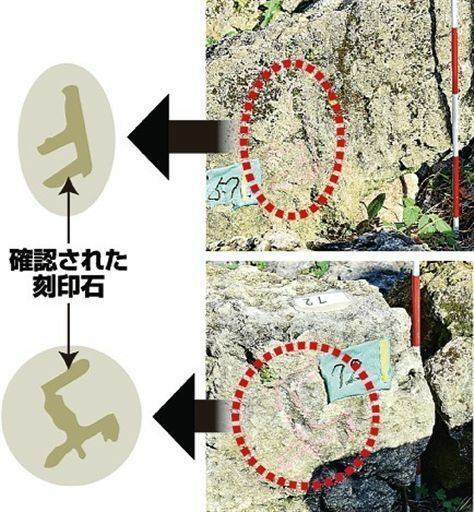 [Nakagusuku] The Nakagusuku Board of Education (BoE) disclosed on February 2 that during their survey of the newly discovered castle wall at Nakagusuku Castle Ruins, the discovered symbols such as letters that resemble an “F” and an “L” and Buddhist swastikas in the stone used to construct the wall. The marks appear to be “seal stones” carved when the wall was constructed. Similar seal stones have been found at Shuri Castle, also in Okinawa, making this the second such discovery. Literature and folklore related to these seal stones are lacking, so the meaning of these symbols are unknown. Experts indicate that the symbols may serve as instructions for the fortification process during construction at Nakagusuku. This discovery is being hailed as having significant influence on Okinawan castle research. These seal stones were discovered during the dismantling of an early 15th-century castle wall as part of ongoing castle repairs. As of the writing of this article, 30 such stones have been confirmed, however there is the possibility that more will be discovered. It is thought that the symbols could be a mark for use during construction, or even a mark placed by masons indicating for what the stone was intended. Outside of Okinawa, there have been examples at Edo and Osaka castles of stones with engraved Daimyo family crests as well as engraved construction symbols. At Shuri Castle, there were also symbols that resemble an “H” or a “+” found at Kyukeimon’s eastern wall, although their meaning or purpose is also unknown. The Nakagusuku BoE is making a record of the measurements and characteristics of each stone being removed, and the plan is to then analyze the variations in the engraved symbols. The castle wall will be measured by laser and digitalized, and the regularity of the placement of these seal stones will be studied.